Newport Beach, Calif., March 18, 2019 — Newport-Mesa Audiology Balance & Ear Institute (the Institute) will present, “Coming Full Circle: Evaluation and Treatment of the Dizzy Patient” at the American Academy of Audiology’s AAA Conference in Columbus on March 30th at 10:30 a.m. Dr. Stacie Pilgrim, Director of Clinical Research, is the Lead Presenter, and other supporting presenters will be Dr. Jennifer Grace, Clinical Director and Dr. Howard Mango, Founder and CEO. Co-presenting will be Jaime Carmody, owner of Midwest Dizziness and Balance Institute (MDBI). Carmody will discuss clinical findings from her patients’ diagnosis and treatment; comparing success rates from conventional therapy and our proprietary Advanced Vestibular Treatment™ (AVT). The Institute’s presentation will explain its unique approach to diagnosing and treating dizzy patients, as many issues originate from the vestibular system in the inner ear, which is the audiologist’s domain. The clinicians will outline how they perform comprehensive balance evaluations and various methods of vestibular rehabilitation, including the use of virtual reality, in an audiology setting. They will also discuss outcome statistics following treatment and share insightful case studies. Identify the important steps to a comprehensive vestibular evaluation and understand the importance for determining differential diagnosis and development of a treatment plan. Evaluate the modern vestibular rehabilitation theories and techniques that are available to audiologists. Define the results of subjective and objective outcome measures following a course of vestibular rehabilitation therapy performed by audiologists. Dizziness is one of the most common complaints in a primary care physician’s office, next to pain and fatigue. 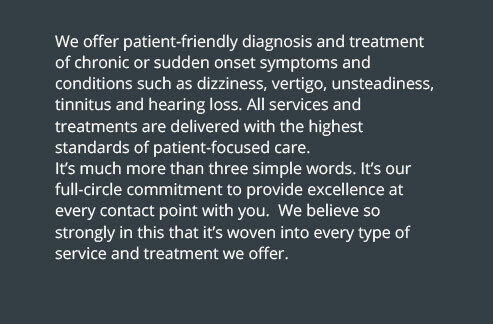 Vestibular dysfunction is the leading cause of dizziness, therefore it falls within the scope of an audiologist’s practice to diagnose and treat the dizzy patient, as they specialize in the inner ear where the vestibular system lies. Research indicates that audiologists believe that a simple vestibular screening, such as a fall assessment, is within scope of practice, however, a small percentage feel they have the knowledge and skills to provide this assessment. The Institute’s clinicians hypothesize that a very similar statistic would be found for views of audiologists on conventional therapy such as vestibular rehabilitation. Vestibular rehabilitation therapy (VRT) is most commonly referred out to physical therapists. However, audiologists possess the knowledge and falls within the scope of practice of vestibular anatomy and physiology, the skillset needed to provide appropriate treatment as well as access to the equipment necessary to provide treatment independently. 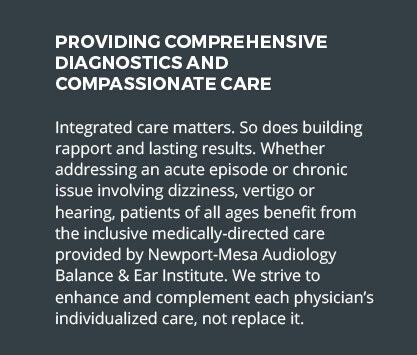 Newport-Mesa Audiology Balance & Ear Institute is one of the country’s leading practices for the research, diagnosis and treatment of patients with vestibular dysfunction – one of the leading causes of dizziness, vertigo and balance disorders. Serving patients from all over the U.S., the Institute’s team of doctors of audiology utilize advanced, state-of-the-art technology at two locations – Newport Beach and Ladera Ranch, California. The Institute provides both comprehensive diagnostic testing and proprietary Advanced Vestibular Treatment™ (AVT) with more than a 90 percent success rate. 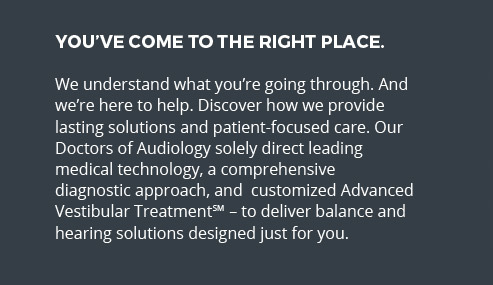 A full spectrum of audiological solutions is also offered to enhance hearing health, including adult and pediatric hearing loss evaluation, advanced hearing devices and tinnitus treatment. 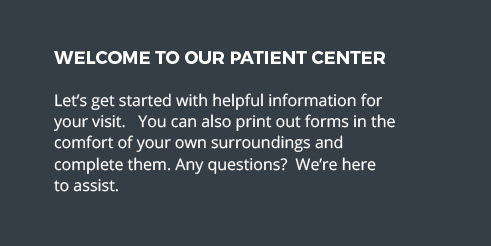 Since 1977, the Institute has served over 50,000 patients. 500 Old Newport Blvd., Suite 101, Newport Beach, CA 92663 | 949.642.7935 | www.dizziland.com.